One of the conditions of playing basketball in the Ligue Féminine 2 is that the club must have qualified statisticians. The Fédération Française de Basketball organised free training sessions at the end of the 2010-2011 season across all divisions for statisticians, which included sessions on how to use the FIBA Live statistics software. Although live statistics were not always available due to one technical reason or other on match day, the statistics were recorded and score sheets were produced for each game. The consistency in the recording of statistics collected around the clubs in LF2 is now much better. So we have decided to put together all the statistics compiled by the Fédération Française de Basketball (FFBB) for all the players in this division for this season. The leading scorer with 20.7 points per game is former Latvian youth international Dace Pierre-Joseph from Dunkerque Malo. She also finished in the top 10 in rebounding with 8.7 rebounds per game and was top of the efficiency ranking with 20.3 points. 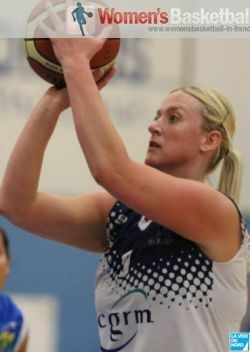 Aurélie Cibert from COB Calais hit 57.9% percent of her shots from within the arc while Aurélie Durand from Dunkerque was the only player to connect above 40% from beyond the arc. Bintou Dieme from Le Havre finished with the best free-throw percentage of 85.1 while Héléna Ciak from Perpignan finished way ahead of the rest in blocks with 2.7 per game. The Voiron duo of Faëza Bouderra and Amanda Lassiter lead the assists and steals category. Aurélie Carmona had the honour to topping the fouls committed while the turnover queen was Aude Kernevez who also played the most minutes in the "Ligue" this year. When it comes to player of the year awards, it is very likely that Ciak will win the award but Pierre-Joseph (in picture) who was also the most fouled was statistically way ahead of any other player. MIN: Average of minutes played, PTS: Points, FG: Field Goals, 2PTS: 2-point Field Goals, 3PTS: 3-point Field Goals, FT: Free Throws, OR: Offensive Rebounds, DR: Defensive Rebounds, TR: Total Rebounds, STL: Steals, TO: Turnovers, AST: Assists, BS: Blocks, PF: Personal fouls and PV: Player fouled on or fouls drawn. You are able to jump to any club statistics by clicking on the link below or by scrolling down the page.